The Terrace Plaza Hotel, on Sixth Street between Vine and Race Streets, is in the heart of downtown Cincinnati. There are many reasons why the Terrace Plaza Hotel in downtown Cincinnati is noteworthy. For one, it’s considered the most important Modernist building in the city. The 20-story building combined two department stores (originally Bond and J.C. Penney), which occupied the first seven levels; offices; a hotel, with an eighth-floor lobby that included a terrace, bar, and the Skyline Restaurant; apartments; and a restaurant, the Gourmet Room, at the very top. But there are other reasons to pay attention to this towering steel, glass, and brick building. Completed in 1948, it was the first International Style hotel building that was built in the United States, with its geometric form and lack of ornamentation. And it was also one of the first hotel projects constructed in the United States after World War II. Terrace Plaza Hotel was the first hotel designed by the now-prominent firm Skidmore, Owings & Merrill (SOM), and one of the first commissions that garnered the firm widespread attention, launching it into the national spotlight. The bulk of SOM’s design work was done by Natalie de Blois, a pioneering female architect who was given the assignment at the age of 24. De Blois and her colleagues planned the building’s every detail, including the furniture, staff uniforms, tableware, and graphics, even down to the ashtrays and matchbook covers. 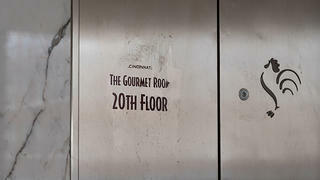 A view of the Gourmet Room restaurant on the building's 20th floor. The building is also noteworthy for the way it incorporated Modernist art into its original design. Alexander Calder was commissioned to create a mobile for the eighth-floor lobby; Joan Miró painted a large mural for the Gourmet Room restaurant; Saul Steinberg painted the wall of the Skyline Restaurant; and Jim Davis created a wall sculpture for the hotel’s terrace bar. And then there are its technical elements. The Terrace Plaza Hotel had the first fully-automated elevator system in the nation, as well as the first dual-heating system that would run on gas and fuel oil or coal. The fire safety sprinkler systems designed for the building’s department stores were considered the most technologically advanced in the world. Its hotel rooms were the first to offer guests a television in every room, and had the first user-controlled air conditioning systems in each room. The Terrace Plaza Hotel has been considered an icon since the day it opened. More than 10,000 people walked through the building on its opening day of July 19, 1948. It received nationwide press, including stories in Life, Time, Harper’s Bazaar, and Architectural Forum. 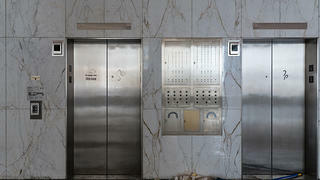 The original marble walls and stainless steel elevator doors are still intact. 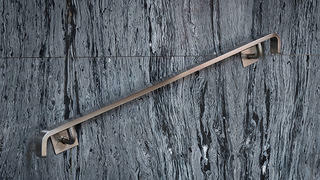 A detail from the door of the elevator that takes visitors directly to the Gourmet Room restaurant. The building has retained a number of its original, elegant details, like the marble walls and staircase railings. Since that day, the building has gone through several rounds of renovations, as ownership changed throughout the years. And in the years since the last hotel to occupy the building closed in 2008, it has sat largely empty, save for three retail tenants on the first floor. But the Terrace Plaza Hotel’s exterior, with its signature cubic massing and brick skin with stack bonding, is still intact. 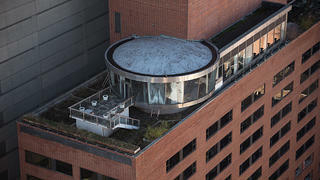 The circular Gourmet Restaurant space also remains, as does the eighth-floor terrace and hotel lobby space, with its marble walls, stainless steel columns, and terrazzo floors. The current owner, who took possession of the building in 2016, marketed the property widely for sale last year. Several offers were made, but a final purchase offer was never accepted. New offers continue to be presented and considered—including one that would radically alter the building’s exterior by removing the historic brick facade and replacing it with glass. That’s a fate Muller and other Cincinnati preservationists hope to avoid. According to a representative of the property, the current owner continues to seek either a joint venture equity partner or a new buyer for the property, and ideally hopes to see a more preservation-minded redevelopment plan come to fruition that would honor the building’s history and architectural significance. Structural engineers have confirmed that the building’s internal steel structure is in good condition, however exterior roofs and flashing need replacement after years of deferred maintenance. 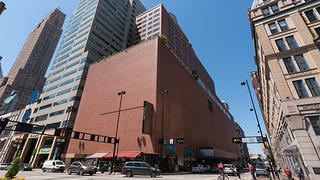 The representative adds that the owner is motivated to reverse the years of decline as soon as possible and re-establish the Terrace Plaza Hotel as a vibrant mixed-use attraction at the center of Cincinnati’s downtown. In the meantime, the Cincinnati preservation community continues to rally for a secure future for the building. Muller notes that while the building is noteworthy for its architectural significance, for many Cincinnatians, there’s a personal side to it, too. But, he adds, its appeal isn’t always immediately obvious.